Shoulder blade long, well laid back, with flat muscles, allowing for moderate space between shoulder blades at peak of withers. Upper arm of equal length, placed so that the elbow falls directly under the withers. The points of the elbows should point neither in nor out, but straight back. A steep shoulder, short upper arm, a heavily muscled or loaded shoulder, or a very narrow shoulder, all of which restrict low free movement, should be strictly penalized. Forelegs straight, giving appearance of strength and substance of bone. Pasterns strong, slightly bent and flexible. Bowed legs, tied-in elbows, legs lacking substance, legs set far under the body so as to create an exaggerated forechest, weak or upright pasterns should be strictly penalized. Both front and rear feet must be well formed with hard, thick pads. Feet more hare than cat, but both are acceptable. Flat, splayed or soft feet without thick hard pads should be strictly penalized. Toes should be long, close and well arched. Nails strong and naturally short or of moderate length. Dewclaws may be removed. Click Here to Learn about breeder background checks on Whippet breeders if you are looking for Whippet puppies for sale. Click Here to learn how ResearchBreeder.com can help you find healthy Whippet puppies for sale.Whippet puppies for sale. Click Here to order a Breeder or Kennel Background Check on Whippet Breeders that may have Whippet puppies for sale. 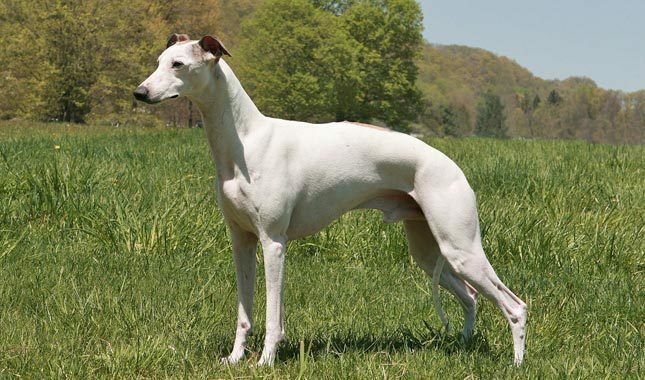 Click here to find the national breed club for Whippet puppies for sale. Click Here to purchase a list of approved ResearchBreeder.com Whippet Breeders who have Whippet puppies for sale.